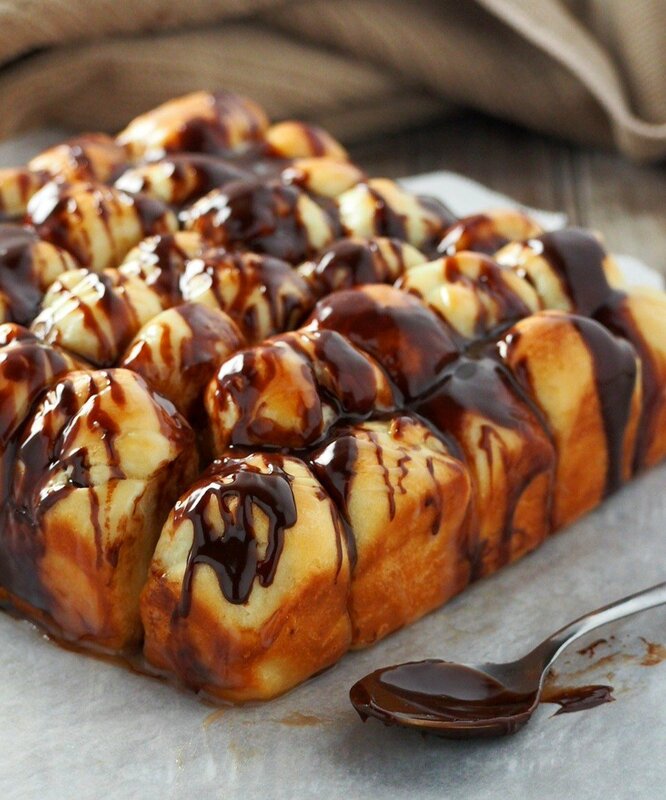 Super soft little bites of bread drizzled with melted chocolate. 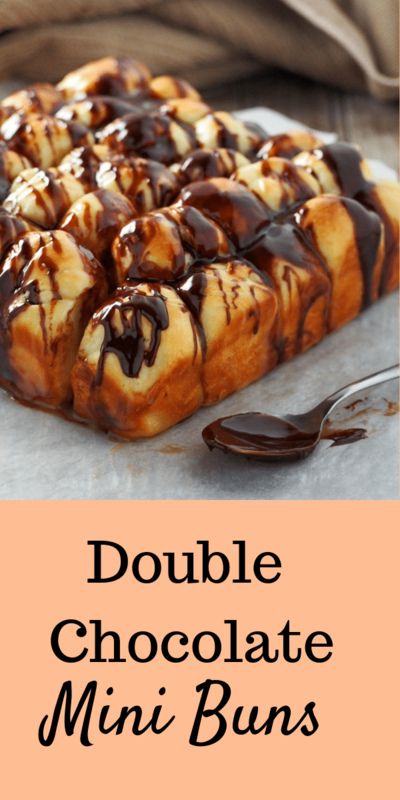 You will love these Mini Double Chocolate Buns as you pop one after another in your mouth. Two things I can lose myself in: roaming around a bookstore and drizzling melted chocolate over these soft little pieces of bread. Take me inside a bookstore and I am in paradise. I can spend hours and hours there and not know how much time has passed by. That is pretty much like taking me inside a bakeshop, too. 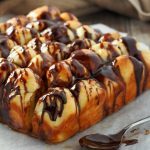 Now as for the drizzling of the melted chocolate, I find it so freeing, having my hands sway back and forth, making jagged lines of chocolate all over the buns. I can’t stop myself. If it were up to me, these mini double chocolate buns will be covered in chocolate that I could not recognize them anymore. But still, I muster up self-control. I got this delicious idea of chocolate drizzles on buns from Youtube. You guys, my jaw literary dropped. The person behind this is a genius. 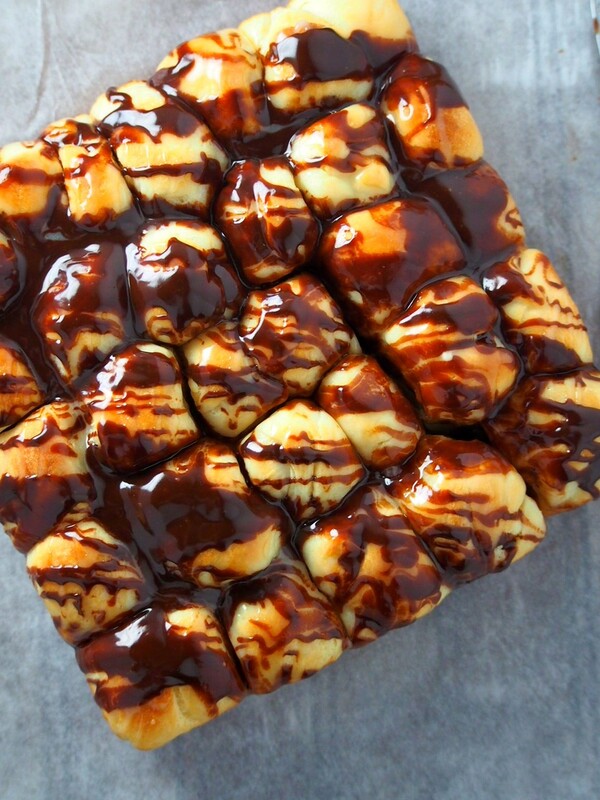 Do you see those intricate thin lines of melted chocolate pouring all over? I can only wish mine is as neat as that. 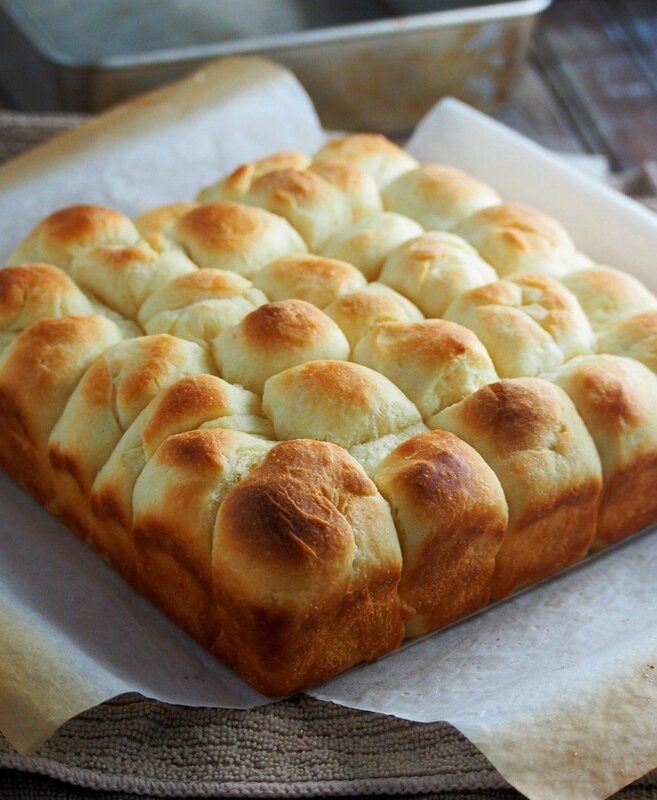 Instead, my buns turn out to be…abstract, or freestyle, or whatever. They are dang good, though. So, so good. First off, proofing the yeast. 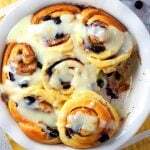 Combine yeast, icing sugar and 1/4 cup of milk in a small bowl. Let the mixture stand for about 20 minutes. It should be foamy and thick by then. 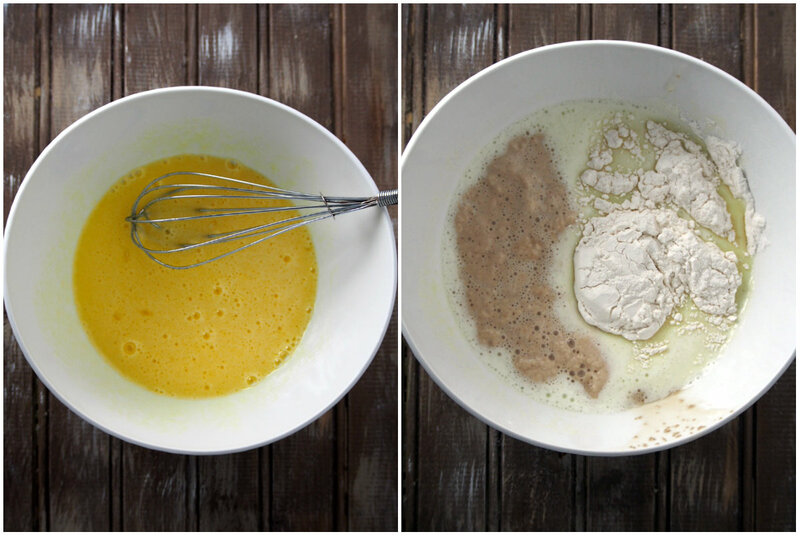 In a mixing bowl, whisk together eggs and sugar. To that mixture, add the proofed yeast, more milk and 1/4 cup of flour. Stir this until it is smooth. Let it stand for 3 minutes. Now add the rest of the flour and salt. Stir the mixture using a wooden for about 7 minutes, until the dough is smooth and shiny. This is a sticky dough so you might need to work those muscles a bit. Then, for a quick relief from the stickiness, pour in two tablespoons of melted butter. Continue to stir for about 5 minutes. The dough should be smoother and shinier. Let the dough rise inside a bowl, covered for 2 hours. Then gently deflate it and cover the bowl with plastic wrap. Chill in the fridge for 1 hour or up to two days. There is your make ahead-opportunity. After the chill, knead the dough briefly just to deflate it. Divide it to 28 portions or so, and form each into a smooth ball. 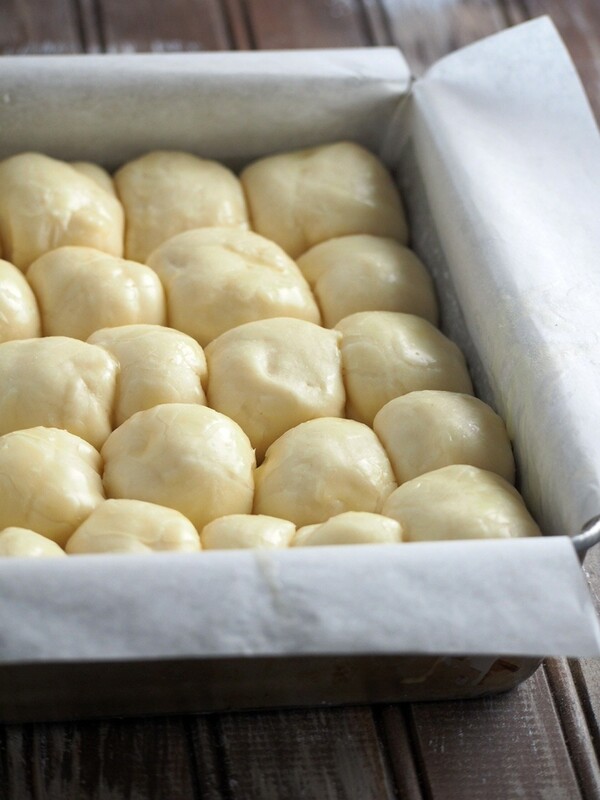 Dip each ball fully in melted butter and arrange them on a lined 7-inch square baking pan. 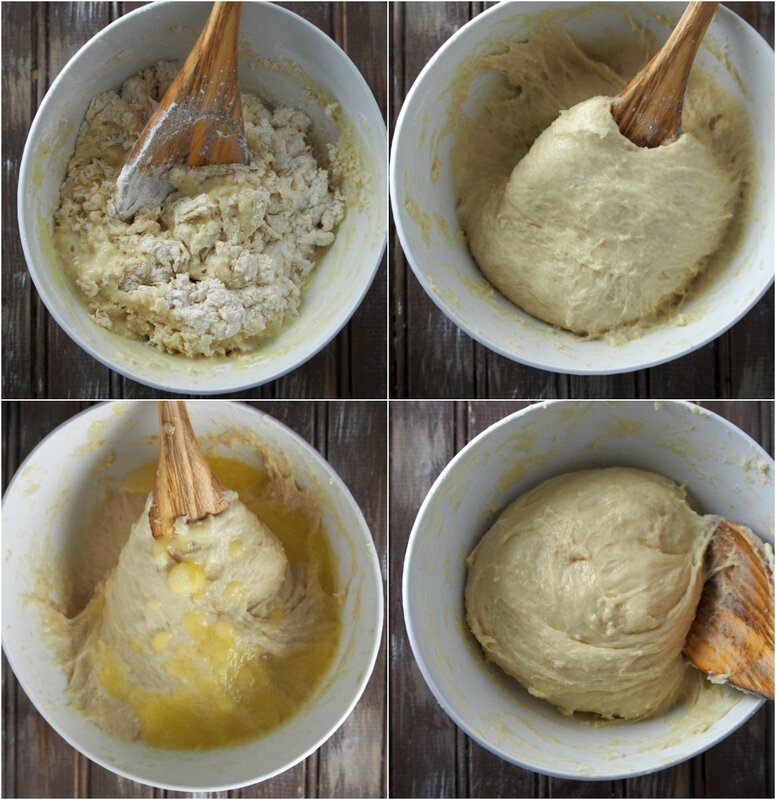 Allow the dough to rise again for 1 and 1/2 hours, loosely covered at room temperature. 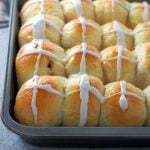 Place a rack in the lowest position in the oven, Preheat to 425 F. Bake the buns in the lowest rack for 5 minutes then lower the temperature to 375 F. Bake for 15-20 minutes more, or until the tops are golden. Let cool. And now, my favorite part! 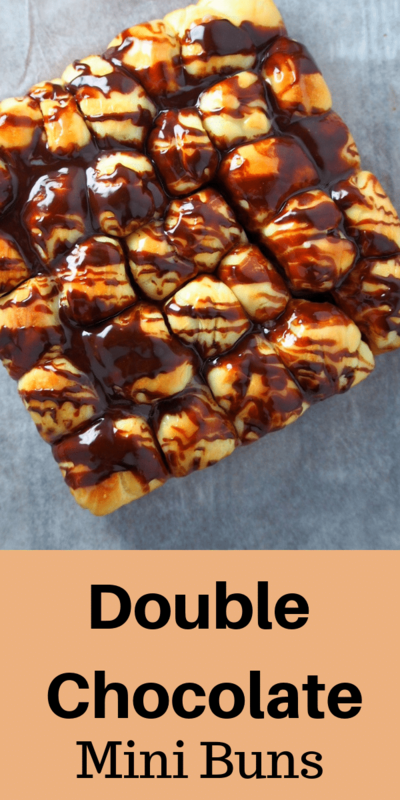 Make the chocolate glazes and drizzle over the buns. First, drizzle the white chocolate in a diagonal angle against the square. Then drizzle the chocolate in a diagonal angle too but start on the opposite side. But you know what, this actually can be done in any way as you please, so scrap that. Instead, drizzle to your heart’s content. Because in the end, all of us will have to dig in and have our faces and mouths covered in chocolate. Pull out a piece my friend. Then another, and another and another. Enjoy! 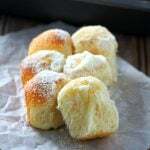 In a small bowl, combine yeast, powdered sugar, and 2 tbsp warm milk. Let the mixture stand for 20 minutes, until frothy. In a large bowl, whisk together sugar and eggs. Add the remaining milk. Add the yeast mixture and 1/4 cup of the flour. 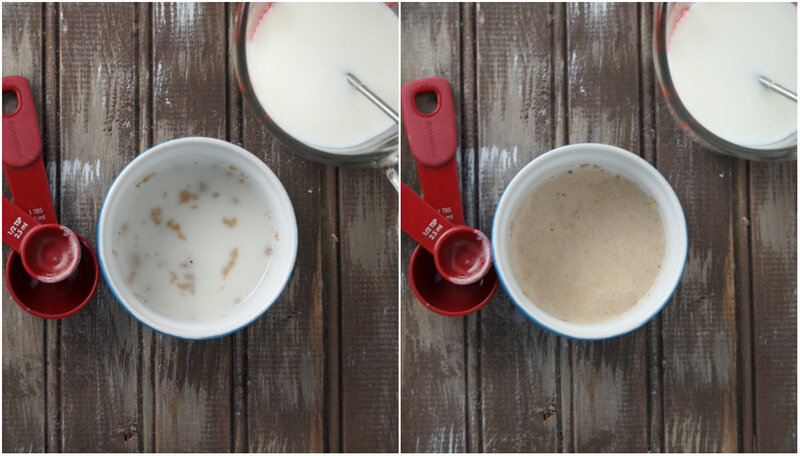 Stir this mixture until it is smooth. Set aside for 3 minutes. Add the remaining flour and salt to the bowl and stir everything until the mixture is smooth and shiny using a wooden spoon. This is a sticky dough and it will take about 7 minutes of stirring to make it smooth. Add 2 tablespoon melted butter and continue to stir for about 5 minutes, or until the mixture is smoother and shinier. Let the dough rise in a bowl for about 2 hours, or until the size is doubled. After rising, deflate it and put it back in the fridge to chill for 1 hour or up to 2 days. Meanwhile, line a 7-inch square baking pan with parchment paper. After the long chill, knead the dough lightly just to deflate. Divide into 28 portions. 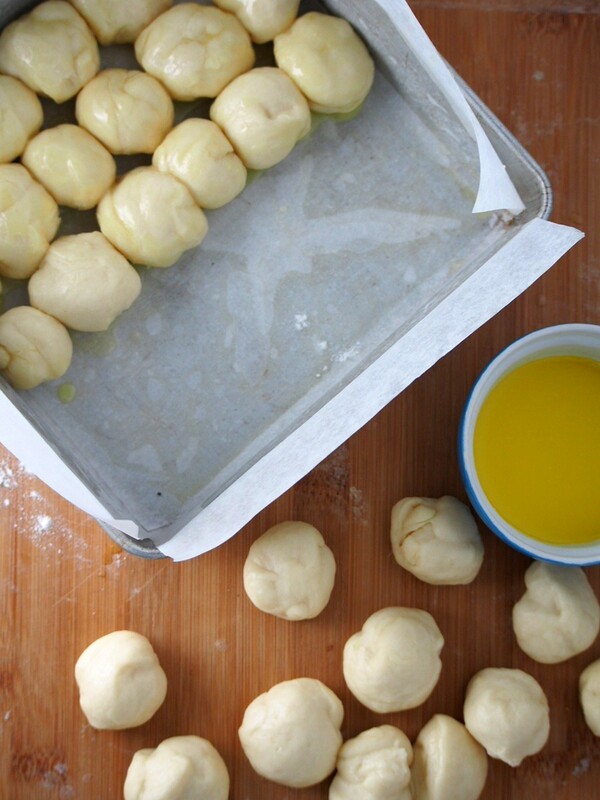 Shape each portion into a smooth ball and dip in the melted butter, making sure to coat all sides. Arrange the balls in the prepared baking pan. Cover them loosely with clean kitchen towel and let rise for 1 and 1/2 hours. Place a rack in the lowest position in the oven. 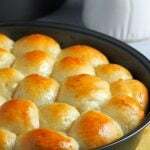 Preheat oven to 425 F. Bake the buns in the lowest rack for 5 minutes then lower the temperature to 375 F. Bake for 15-20 minutes more, or until the tops are golden. Let cool. 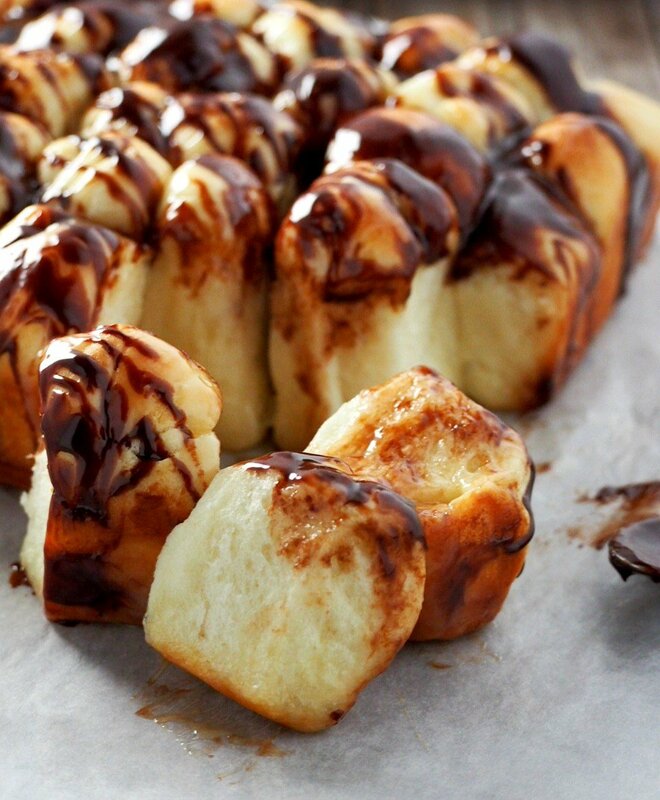 Make the chocolate glazes. 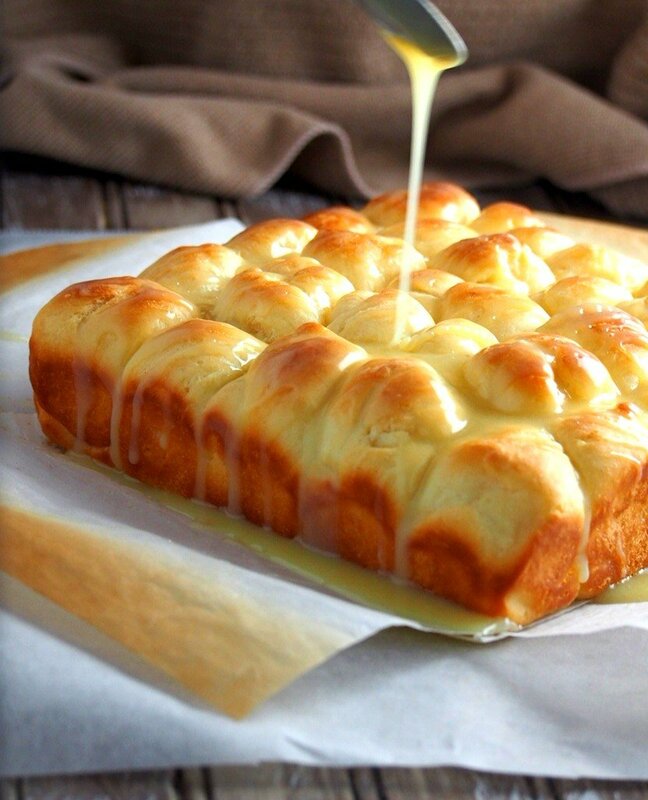 Drizzle the white chocolate in a diagonal manner all over the tops of the buns. 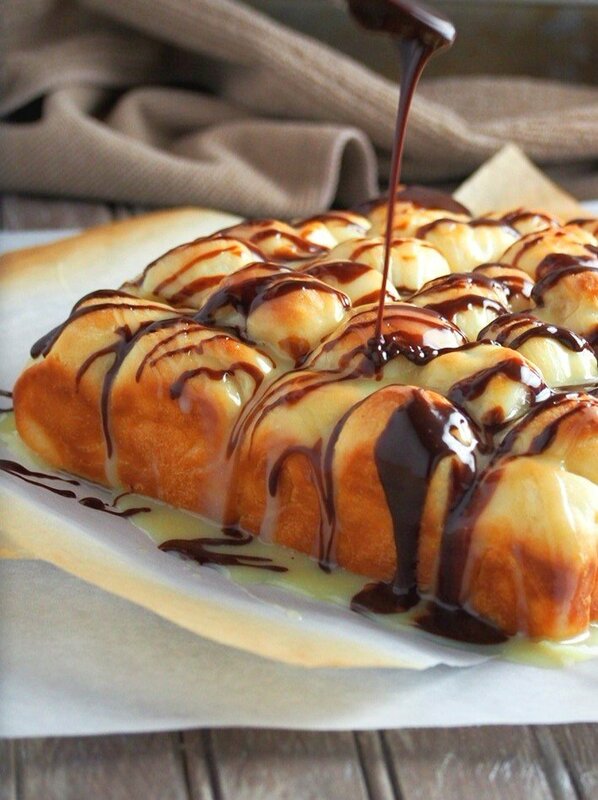 Next, drizzle the chocolate glaze in a diagonal angle too but in the opposite direction as the white chocolate. Serve and enjoy! Dough recipe adapted from Rose Levy Berenbaum, Austrian Buchteln-The Pie and Pastry Bible. This post contains affiliate links. Please see my disclosure page to learn more.